SAN FRANCISCO, Jan. 25, 2019 /PRNewswire/ -- John Alfirevich, of Apple Chevrolet in Tinley Park, Ill., today was named 2019 TIME Dealer of the Year during the 102nd National Automobile Dealers Association (NADA) Show in San Francisco. The Chicago-area dealer's many contributions to local charities — nearly 100 organizations have benefitted in 2018 alone — and his commitment to do right by his customers, employees and community earned Alfirevich the prestigious award. He was selected from a field of 51 dealer nominees throughout the country. 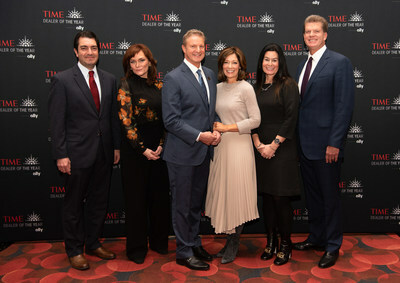 Doug Timmerman, president of Auto Finance for Ally, and Susanna Schrobsdorff, executive editor and chief partnerships officer of TIME, announced Alfirevich as the winner at a ceremony where all the dealer nominees were honored. Timmerman remarked: "As Ally enters its 100th year in the auto business, we've witnessed a lot of change in the industry. One thing has never changed—the significant impact dealers have on their communities. I'm proud to recognize John and all the nominees for their dedication to their employees and communities, exemplifying how to 'Do it Right' every day in their dealerships." 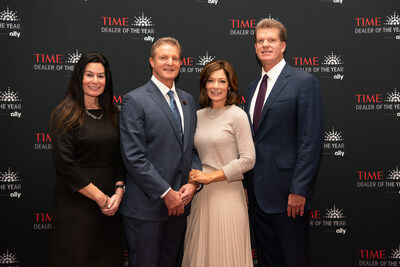 Only a fraction of the more than 16,000 franchised dealers across the country are nominated each year for the TIME Dealer of the Year award, which is presented by TIME Magazine and exclusively sponsored by Ally Financial. Regional finalists for the award, who were also named during the ceremony, are John Kendall Garff of Ken Garff Honda Downtown in Salt Lake City; Frank Hug Jr. of Hug Chevrolet Buick GMC in Charleston, Ark. ; Ryan LaFontaine of LaFontaine Cadillac Buick GMC in Highland, Mich.; and Eric Nielsen of Nielsen Dodge Chrysler Jeep Ram LLC in East Hanover, NJ. Ally will give $10,000 to the charity of Alfirevich's choice. In addition, $5,000 will be donated to the nonprofit organizations selected by the four finalists and the state Automotive Trade Association Executives who nominated the 2019 TIME Dealer of the Year. In recognition of their achievements and generosity, Ally gave $1,000 to the charities of choice for all 51 nominees. For more information on each of the nominees, please visit www.AllyDealerHeroes.com. Alfirevich began his career in the car business at the age of 12 at Bob Motl Chevrolet in Chicago, which would later become Apple Chevrolet. "My father, Joseph, was general manager of the dealership at the time and called me in to perform oil changes and other quick maintenance because of a local mechanic strike that lasted the entire summer," he said. "Since that day, I have worked in every department and started my full-time career at the dealership in 1986." Today, Alfirevich and his father own the dealership, which they moved to Tinley Park. When starting out in the automotive business, Alfirevich was concerned more established dealers would always have an advantage. "However, my passion, will and desire to always do the right thing has persevered, motivating me and keeping me wanting more for my dealership, my employees and my community for 35-plus years," Alfirevich explained. He credits the dealership's philosophy of treating customers with "unpretentious integrity" as a key to success as well as the dealership's emphasis on honesty and transparency in every transaction. Over the last year, Apple Chevrolet has donated to nearly 100 organizations, including the American Legion Auxiliary; Better Business Bureau Educational Foundation; Colon Cancer Coalition; Gigi's Playhouse Down Syndrome Achievement Centers; JDRF (Juvenile Diabetes Research Foundation); The Salvation Army; Special Olympics; USO of Illinois, as well as many schools, churches and sports teams. "I believe dealers play an enormous role in their communities by donating to many great causes to advance the well-being of their communities," he said. Alfirevich is very active in the Chicago Automobile Trade Association and has served on many of the group's advisory boards and committees. In 2015, he was chairman of First Look for Charity, a fundraising event and celebration held the evening before the Chicago Auto Show, which raised $3 million to benefit Chicago-area charities. Alfirevich, a 1981 graduate of St. Francis de Sales High School in Chicago, earned a business/marketing degree from Benedictine College in Atchison, Kan., where he received an athletic scholarship to play football. He furthered his training by attending the NADA Academy in 1990. He was nominated for the TIME Dealer of the Year award by Pete Sander, president of the Illinois Automobile Dealers Association, and David Sloan, president of the Chicago Automobile Trade Association. The finalists and the winner were chosen by a faculty panel from the Tauber Institute for Global Operations at the University of Michigan. Ally Financial Inc. (NYSE: ALLY) is a leading digital financial services company with assets of $173.1 billion as of September 30, 2018. As a client-centric company with passionate customer service and innovative financial solutions, Ally is relentlessly focused on "Doing it Right" and being a trusted financial partner for its consumer, commercial, and corporate customers. Ally's award-winning online bank (Ally Bank, Member FDIC and Equal Housing Lender) offers mortgage-lending services and a variety of deposit and other banking products, including CDs, online savings, money market and checking accounts, and IRA products. Ally also promotes the Ally CashBack Credit Card. Additionally, Ally offers securities brokerage and investment advisory services through Ally Invest. Ally remains one of the largest full-service auto finance operations in the country with a complementary auto-focused insurance business, which together serve approximately 18,000 dealer customers and millions of auto consumers. Ally's robust corporate finance business offers capital for equity sponsors and middle-market companies. TIME is a global multimedia brand that reaches a combined audience of more than 100 million around the world. A trusted destination for reporting and insight on the people, places and issues that matter, TIME captures the events that shape our lives. TIME's major franchises include the TIME 100 Most Influential People, Person of the Year, Firsts, Best Inventions, Genius Companies, World's Greatest Places and more. With 45 million digital visitors each month and 40 million social followers, TIME is one of the most trusted and recognized sources of news and information in the world.